I’ve done quite a few posts on just how silly Passover and Easter are. 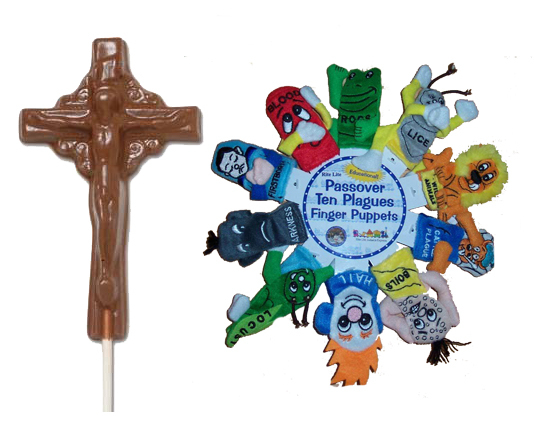 yes, there are indeed cruxifix chocolate molds and plague finger puppets. Yay, dead people! Yeesh. My exodus series can be begun here. Here is a main post on easter. I’m sure you can find more just by searching over here in the upper right hand corner search box. Conservative Christian antics about easter is here in case you forgot just how stupid Bill O’Reilly and Laura Ingram are. Guinea pigs and easter, and not how you might think is here. The mess that the cruxifiction stories are is here. This year we have the Notre Dame cathedral in Paris burning during Holy Week. And now we have people giving a BILLION dollars to a vanity project built over around a thousand years for a god that needs to be placated by pretties just like the nonsense in the bible. It’s been a while since I posted about food. We usually cook for fun on weekends and things have come up on weekends since about mid-March, when we both got the flu and have continued until this weekend, when my folks visited. The one thing that was cooked, and by my spouse, are a couple of things using refrigerated pizza dough in the can that you pop open (biscuits often come in them here in the US, the fluffy scone-ish ones, not hard crunchy ones that us Yanks call cookies). He made the Stromboli version for me after I had a long day helping staff a conference with fellow staffers talking about their families which might as well be on a bad reality show. The technique is the same and you can use any filling you’d like. The dough comes in a rectangular sheet. Cut in a third from each side in one inch (2.5 cm) strips (a rolling pizza cutter works best). Put the filling in the center, cross the strips and pinch together the short ends to keep the filling in place. Bake at 400 degrees F (roughly 200 degrees C) for twenty minutes. We put them on baking parchment paper on a cookie sheet. The first was our version of Stromboli (it’s the picture at the upper right of this post). After the dough is cut, spread around 2 tbsp of mustard (we like the whole seed stuff) on the raw dough. Then, put approximately 1/3 pound (0.15 kg) each (!) of thinly sliced provolone, ham, hard salami, and pepperoni down in that order on the non-cut dough. On top, put a good handful of shredded mozzarella and cross the dough strips over, sealing the ends. He had two extra strips left over so they became antennae on our rather trilobite-ish looking bundle. Just enough grease escapes to make a crisp bottom crust. Before baking, he brushed the top with flavored olive oil and dusted it with garlic powder and dried oregano. The second was a cherry cream cheese Danish-oid thing. The filling was half a can of cherry pie filling, and half a block of cream cheese. The cheese was on the outer long edges to corral the pie filling. He brushed the bottom of the crust with butter to get it nice and brown and brushed the top of the crust with butter, sanding it with sugar. We also added a basic glaze of confectioner’s sugar (fine sugar with cornstarch) and milk. Well, that’s it for now. Eat and drink well! Well, I finally have some time to write a blog post. Between work, and painting, and simply being disgusted with the world, I put this off. I did do a couple of craft shows with my alcohol ink paintings and I sold one thing on Etsy. Made back my entrance fee and then some, so I’m happy about that. I decided to start trying to sell my art since it was starting to overrun the house. Now, back to my favorite topic, Christians behaving badly. Here in PA, we had a particularly virulent TrueChristian™ make a scene when Rep. Borowicz tried her best to convince her god that it wasn’t her fault that the PA voters elected a woman who happens to be Muslim to the state legislature. She gave the opening prayer at the legislature and was a wonderfully bigoted twit, ignoring her bible when it says don’t pray on street corners. She claims she prays like this “all of the time”. Sure, dear, I have no problem that you are a jackass whenever you do much of anything. I have also been kibitzing on various blogs where a theist, usually a Christian, is making false and/or baseless claims about atheists or the universe in general. When the theist responds to a post, it’s amazing how quickly they end up attacking their fellow Christians, when I point out how much they don’t agree. For a religion of supposedly “billions”, they show quite definitely that Christianity isn’t one religion but many very small ones. I had one fellow “Triggerman” insist that Baptists aren’t Christians by definition “A Christian can be a Baptist, just like a Christian can be a Methodist, or a Presbyterian or a Catholic or even a Pentecostal or a non-denom. However, just being a Baptist, etc, doesn’t make anyone a Christian.”, that Catholics aren’t Christians at all and that Christians who don’t agree with his version are “Free to think whatever they want and impose all of the FALSE standards they want to.” Tsk. I asked poor TM how does his god choose who to damn and who to allow to believe in this god if not randomly. It’s always fun to watch them insist that they do know but when it comes to saying how, there’s not an answer to be had except an attempt to redefine the word “random”. A friend has a new website up with the more vile words of a Christian I’ve also crossed swords with, John Branyan. You can find it here. It is holding Christians accountable for their claims and beliefs. I also found Caroline again, a Christian who has occasionally shown up (just search “caroline” in the search box in the upper right to see all of the instances) on this blog, making her usual false claims about morality and how great her morality is. She is a great example of someone using about ever poor apologist bit of nonsense in her arguments. There are no comments allows on her blog if you don’t agree with her (though she has let me post in the past), but I did happen to find her on facebook. Again, it ended up with her not answering some very basic questions: “why is objective morality “better” than subjective morality” and “why is stealing from someone wrong?”. My comments still there if you are interested (you’ll see posts from Jane R., that’s me). I find it very funny that she calls herself “friendlier theist” there. This comes from a theist who said this to me “Enjoy your Godless life…while you can.” She claimed to be arguing just for “theism” and not Christianity. This attempt to move goalposts isn’t a new thing at all. It’s nothing new that Christians claim that those other Christians aren’t really Christians at all. There is not one new bit of evidence to support the existence of any of the billions of versions of the Christian god nor for any other god. It’s the same old arguments. The most recent one might be the argument from complexity, and that’s only because we could start to see that complexity. The rest, the early church fathers would recognize. With Easter coming up, a lunar and fertility holiday that moves all around thanks to other religion’s beliefs, we see again that it’s been 2000+ years and still nothing has changed. No miracles, no baptized believers in JC as savior doing miracles as promised, no elders of the church doing miracles, no JC descending from the clouds in his end times return. Just lots of failed stories and baseless claims. And no god serving as back up to a lot of incompetent apologists. People ask, why do I bother? Well, I don’t like liars and I don’t like people who think it’s their right to harm people in trying to take away their ability to make an informed decision. “An international research team, including a member of the Complexity Science Hub Vienna, investigated the role of “big gods” in the rise of complex large-scale societies. Big gods are defined as moralizing deities who punish ethical transgressions. Contrary to prevailing theories, the team found that beliefs in big gods are a consequence, not a cause, of the evolution of complex societies. The results are published in the current issue of the journal Nature. While I’m still dealing with influenza (I always forget just how horrible it makes you feel (and to see why you do feel horrible see here)) , I thought I’d do a post about the current religious nonsense here in the US. We have conservative Christians having a tizzy that a US representative criticizes the country of Israel. They lie, of course, and try to claim being anti-Israel is being anti-Semitic. That the government of Israel continues to flirt with acting exactly like their historical persecutors, makes it a target for just criticism. When these same conservatives have no problem with worshipping a orange nitwit who says that wannabee nazis are “fine people” and the vice president is of a strain of Christianity that desperately wants the events in Revelation to come true and needs the state of Israel to be on the stage to be destroyed, this concern about anti-Semitism is nothing but poorly hidden hypocrisy. “7 Now if the ministry of death, chiseled in letters on stone tablets, came in glory so that the people of Israel could not gaze at Moses’ face because of the glory of his face, a glory now set aside, 8 how much more will the ministry of the Spirit come in glory? 9 For if there was glory in the ministry of condemnation, much more does the ministry of justification abound in glory! 10 Indeed, what once had glory has lost its glory because of the greater glory; 11 for if what was set aside came through glory, much more has the permanent come in glory! Except for the Book of Hebrews itself, one can’t find much more of an anti-Jewish screed in the bible. Paul is still the persecutor, he just changed his colors and his horse. 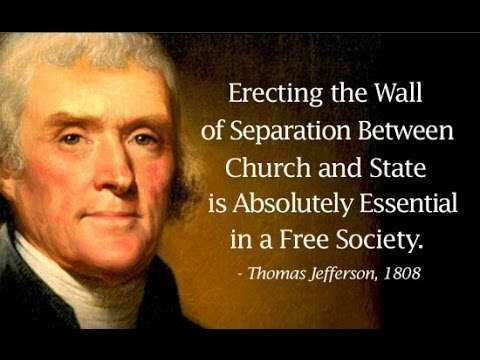 And that is what these ever so concerned Christians want to have Trump sign and cite. What I discovered that I didn’t know before is that some Muslims find that Paul to be a corruptor of JC’s word too. What a mess of imaginary claims, who hates who for what reason and all of it nonsense. Of course, it’s these conservative Christians who insist that it was a “miracle” they *personally* weren’t killed (evidently 23 deaths were their god’s will) and how it’s just great that they get special attention from FEMA (Federal Emergency Management Agency) for help but who cheered when that jackass Trump threatened the help received by people they don’t agree with in California. What a foul tangle human invention makes to validate ignorance and selfish nonsense. Hello from under Winter Storm Petra! We have about 5 inches of snow and we’re supposed to get ice on top of that. 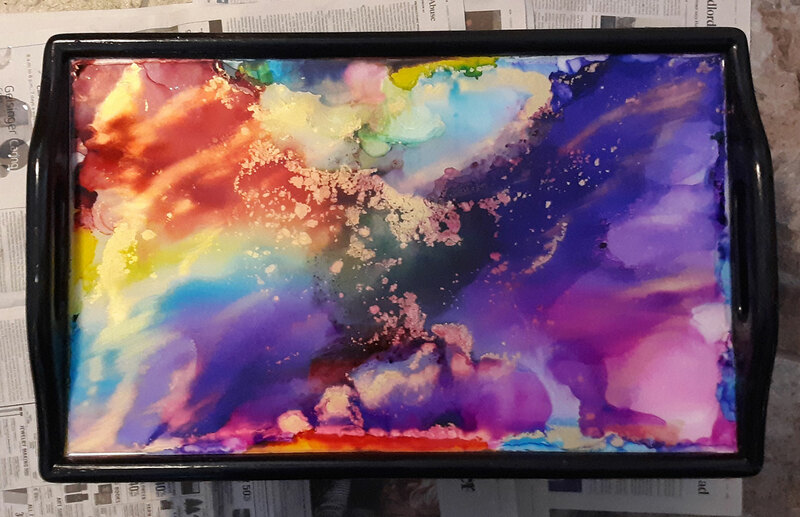 If you’ve been following my blog, you may know that I dabble in art, specific alcohol inks. Here are two pieces. The top is a lap / bed tray (the kind with little legs) that I found at a thrift store. It was originally a pale blonde wood, which I painted black. The bottom was white melamine, a nice slick surface for the inks to flow around on. After they dried, I sealed it and then put a layer of resin on top of it for durability. The second is a lazy susan I found on the same thrift store adventure. It is also ink and protected with resin. 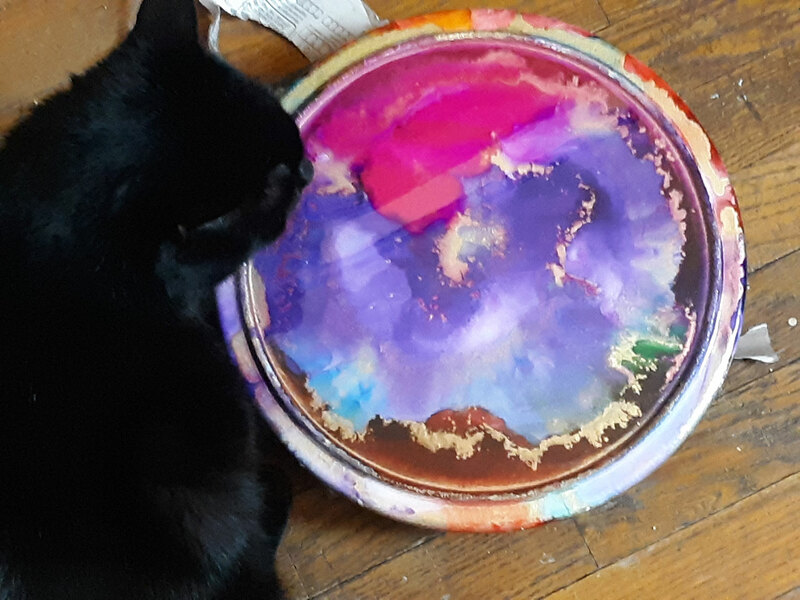 My one cat, Tezcatlipoca, is investigating it. 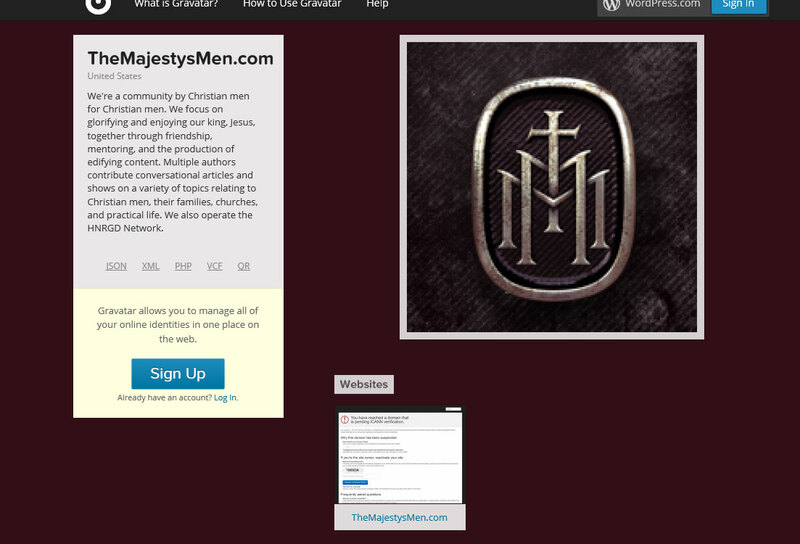 Let us all welcome “The Majesty’s Men”, a Christian website that seems be, well, interesting. This is from their gravatar page. Their website hasn’t been verified by ICANN yet. They do have quite a nice logo, if rather a bit over the top, something like I’d expect in a Dan Brown novel or perhaps on Warhammer 40K power armor.